I was first introduced to split wood basketry by my friend Owen Jones who makes oak swills. Also Lluis Grau in Spain. I have some lovely split wood baskets made in Eastern Europe too but I think some of my favourite split wood baskets come from the various North American traditions. I want to share some films of three split wood basket makers. First Terry Gibson 4th generation split oak basketmaker, I like the way he makes the splints with a big spokeshave like tool and he is clearly very fast. another slightly more basic split oak basket. And this is the gem, thanks to Sean for this. A 1985 film showing ash splint basketry. I have really loved split ash baskets since first seeing Martha Weatherbee's work in Drew Langsner's books. The descriptions I have heard of pounding have sounded really long winded though and the clip in this film at 28 minutes is incredible. The trick is clearly not continuing pounding at 90 degrees as I had always read but afterwards pounding at an angle. I also loved the discussion at 19 mins about what is a fair price, not "how much will the customer pay?" but "what is a fair price?" The riving at 20.30 is impressive too. The first 10 minutes is background to the lifestyle so if you just want baskets skip to 10 and then 20 mins. 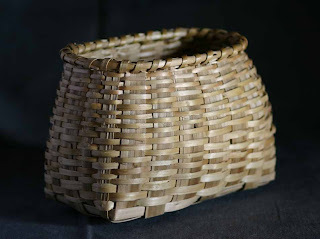 And finally links to two US sites, a nice blog by basketmaker and teacher of split wood baskets.